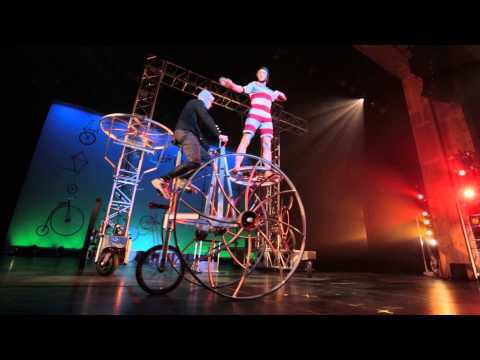 Cirque Mechanics brings "Pedal Punk" to Stanford's Memorial Auditorium on Sunday, March 22. Image courtesy of Stanford Live. This week, check out the Steampunk stylings of a Las Vegas-based circus troupe, hear National Book Award-winning author Joyce Carol Oates discuss her latest novel and stop by an art exhibition in Redwood City. What's as unique as a unicyclist, trippier than a trapeze artist and more fun than a funambulist? The answer is "Pedal Punk," the newest circus show from Las Vegas-based company Cirque Mechanics. Inspired by the Steampunk genre and the beauty of the bicycle, "Pedal Punk" takes audiences on a wild ride through a world of wondrous wheels. Imagine a rowdy bicycle mechanic's shop full of acrobats, aerialists, gymnasts and jugglers, and you'll have an idea of what's in store. "Pedal Punk" is a family-friendly show featuring mechanical marvels including the 20-foot-tall, pedal-powered Gantry Bike. Stanford Live brings Cirque Mechanics to Memorial Auditorium, 551 Serra Mall, Stanford University, on Sunday, March 22, at 2:30 p.m. For tickets, go to live.stanford.edu or call 650-724-2464. One of America's most celebrated and prolific writers, Joyce Carol Oates is the author of more than 70 novels, short story collections, plays, essays and poetry volumes. In bestselling novels including "A Garden of Earthly Delights" (1967), "We Were the Mulvaneys" (1996) and "Blonde," (2000), she explores universal issues including social class, racism, femininity and family dynamics. The National Book Award winner and Princeton University professor will appear at Menlo Park's Kepler's Books (1010 El Camino Real) on Wednesday, March 25, at 7:30 p.m. to discuss her latest novel, "The Sacrifice." Set in a small New Jersey town, the novel centers around an alleged act of racial violence that shocks and transfixes a community. The story unfolds through a series of voices and perspectives, raising questions about the society we think we live in and our role in perpetuating racism and bias. Oates will appear in conversation with Michelle Richmond, New York Times bestselling author of "The Year of Fog." Tickets to the event are $20 general admission, $10 for students and $40 for premier seating, including a copy of "The Sacrifice" and priority for book signing. For tickets, go to keplers.com. Hues and shades are among a visual artist's most fundamental considerations. In two art shows opening in Redwood City this week, questions of color, darkness and light take the focus. Main Gallery artists' cooperative members Jeanne Gadol and Diana Herring present "Warm/Cool," while photographer Robin Apple and mixed-media artist Ginger Slonaker exhibit "Shadows." In "Warm/Cool," Gadol's re-worked photographic images present elements of the natural world in a limited color palette, while Herring infuses her prints with warm and cool hues. Apple turns her lens on architecture, finding suggestions of dark emotions in the exteriors of buildings, while Slonaker exposes the shadows in human subjects, seeking to depict the truths that often lurk just out of sight. On Saturday, March 21, from 5-7 p.m., the public is invited to a free reception with the artists at the Main Gallery, 1018 Main St., Redwood City. Both "Warm/Cool" and "Shadows" run through Sunday, April 19. The gallery is open Wednesday-Sunday, 10 a.m.-3 p.m. To learn more, go to themaingallery.org or call 650-701-1018.